Do Learning Environment and Self-Efficacy Impact on Students Entrepreneurial Attitude? Learning Environment and self-efficacy are considered to be two important factors influencing entrepreneurial attitude. This study was conducted to determine the entrepreneurial attitude and self-efficacy of 300 vocational secondary school students at DKI Jakarta. This study used the survey method with the causal approach. The data was collected through a questionnaire and then analysed using path analysis. The findings indicate that the learning environment had directly and positively effect on self-efficacy. Learning environment also had directly and positively effect on entrepreneurial attitude. Self-efficacy was directly and positively effect on entrepreneurial attitude. Although this research tries to provide a better view of entrepreneurship education, particularly in self-learning environments and entrepreneurial attitudes, it may be different from other schools as a result of cultural differences, the ability of teachers and the model of learning to be undertaken. Learning Environment, Entrepreneurial Attitude, Self-Efficacy, Vocational Secondary Students. Entrepreneurship development is the primary focus of the education system, both in developed countries. This is due to the positive impact that supports social development, community empowerment, economy and organization (Akmaliah and Bagheri, 2010; Collins and Hannon, 2008). In Indonesia, entrepreneurship development is one of the national education strategic policies in utilizing demographic bonuses for the next five years (Puspayoga, 2017; Purwana and Suhud, 2017). The development of entrepreneurship education in Indonesia is also to increase economic independence and create prosperity of society. That is relevant according to McClellan (1961) that a nation can achieve prosperity if it has a minimum number of entrepreneurs as much as two percent of the population. Strategic steps in the framework of establishing and developing entrepreneurship, conducted in various ways, among others through education, skills training, and enhancement of entrepreneurial skills (Wu and Wu, 2008). Educational institutions as managers of human resources, able to instill and foster entrepreneurial values in learners to produce graduates who have the character of entrepreneurship with the orientation as a creator of employment not as a job seeker (Obschonka, and Goethner, 2015). Vocational High School (SMK) in Indonesia seeks to educate students to be ready to work and become entrepreneurs (Amin, 2015). SMK is also proven to develop human resources who can work professionally in the field by prioritizing the potential and local wisdom as a form of environmental excellence (Setiawan, 2017). One of the goals of entrepreneurship education is to cultivate entrepreneurial desires in students. This effort requires a large teacher role. That is, teachers, play an essential role in the formation of an entrepreneur through the proper learning process (Dinis, 2013). The family and community environment also play a role in the creation of an entrepreneur. Values that the family instills in a child, such as an impulse to go ahead and achievement without excessive stress can shape the nature of self-employment in children. Similarly, the community environment, where the surrounding environment supports the birth of character and entrepreneurial spirit will affect the formation of entrepreneurship. In facts, many parents prefer their children to be employees to companies or a government agency because of being an entrepreneur has a high risk of failure and considerable capital (Bruff, 2009). Research related to self-efficacy and attitudes towards entrepreneurship is already widely done. Findings of Zhao (2005) and Autio (2001) aligned that self-efficacy and entrepreneurship attitudes can be nurtured through education. However, research that focuses on the influence of the learning environment on self-efficacy and entrepreneurial attitudes is still minimal. The findings Vuong (2010), Katarina (1993) and Khuong and Mai Ngoc (2016), has not discussed in detail how the direct impact of the learning environment on self- efficacy and entrepreneurial attitudes. This study aims to narrow the gap in the review of literature and empirical with the focus of testing the influence of learning environment and self-efficacy on entrepreneurship of vocational students. In particular, this study focused on the direct impact of the learning environment on entrepreneurial attitudes; the direct impact of self-efficacy on entrepreneurial attitudes; the direct impact of the learning environment on self-efficacy and the influence of the learning environment on entrepreneurial attitudes through self-efficacy. This study is based on the assumption that a conducive learning environment for entrepreneurship will affect the development of self-efficacy and entrepreneurial attitudes as the findings Khuong and Mai Ngoc (2016), and Akmaliah et al. (2010). One's attitude towards an object acts as an intermediary between its response and the object concerned who then crystallizes as a potential reaction to the attitude object. According to Ajzen (2002), attitudes represent a summary of the evaluation of psychological objects recorded in some dimensional attributes such as good-bad, harm-beneficial, happy-sad and liked-disliked. The study of the characteristics of entrepreneurs has done a lot of researchers and experts in the field of entrepreneurship. The study attempts to answer the critical question of why entrepreneurs have different characteristics from others, based on the assumption that entrepreneurs are a significant component of the entrepreneurial process in all (Heinonen, 2006). By knowing their personalities and traits in depth and accuracy, we will be able to develop qualified entrepreneurship training and education strategies to others (Kundu and Rani, 2008). Some researchers conclude that personality has a positive influence on someone to entrepreneurship (Thomas and Mueller, 2000), such as the need for achievement (McClellan, 1961; Fayolle and Gailly, 2015) and self-efficacy (Shinnar et al., 2014). While some other studies have found that demographic factors such as gender, age and previous experience also trigger attitudes and entrepreneurial behaviours (Liñán and Chen, 2009). However, some researchers have recently tried to criticize the reliability and validity of personality and demographic characteristics to predict entrepreneurial attitudes and behaviours, as these findings do not develop dynamically (Akmaliah et al., 2010; Thomas and Mueller, 2000; Ajzen, 1991; Robinson et al., 1991). This debate caused the researchers to shift the focus of the study on the characteristics of the entrepreneur through an attitude perspective, which has a stronger measure than the entrepreneurial behaviour, perceptions and minds (Robinson et al., 1991; Ajzen 1991; Ajzen, 2002). Nevertheless, personality and attitude characteristics are still applied to predict entrepreneurial behavior (Akmaliah, 2010; Kundu and Rani, 2008). In this case, entrepreneurial behaviour is a function of attitudes toward values, benefits and enthusiasm for entrepreneurship (Ajzen, 1977). According to Akmaliah (2010), changes in entrepreneurial attitude can be done through the process of learning, experience, interaction with the environment, as well as with intensive entrepreneurship education program. Therefore, entrepreneurship education needs to be improved by focusing more on developing entrepreneurship attitudes of students (Luca, 2012; Holmgren, 2005; Wyk and Boshoff, 2004; Robinson et al., 1991). Although some researchers agree that entrepreneurship education can enhance and even reinforce students' entrepreneurial attitudes, there are also findings that nullify them. In short, there are findings that entrepreneurship education does not improve entrepreneurial attitudes, even lower the intention of students to pursue the business world (Fuchs and Wallau, 2008). The difference in findings is likely due to the object and methodology used. However, overall the study of the relationship between entrepreneurial self-efficacy and entrepreneurial attitudes, found that entrepreneurial attitudes were relatively high among students compared with middle school students (Kundu and Rani, 2008). Schwarz et al. (2006) examined the effect of attitudes and environmental conditions on student entrepreneurship intentions in Austria. The results concluded that attitudes and environment proved as an important factor as a predictor of intent entrepreneurship. Thus attitudes play an important role in growing entrepreneurial intentions and can be developed from an early age. This is reinforced findings of Dinis (2013) that early formal entrepreneurship education will influence students' attitudes and influence them in determining career direction with entrepreneurship. Thus entrepreneurship education at elementary and secondary level becomes important in growing entrepreneurship attitude. According to Sarwono (2009), human attitudes are not something inherent from birth but obtained through a learning process that is aligned with the development of his life. Attitude is formed through four kinds of learning, namely: classical conditioning: Learning Based on Association, instrumental conditioning, observational learning, learning by example and social comparison. Likewise, entrepreneurial attitudes in education can be encouraged by meaningful learning experiences such as through business incubation (Soria and Rodríguez, 2017). Business incubation is a program designed to foster and accelerate the success of business development through a series of capital programs that are followed by partnership support, management and technology coaching. With business incubation, students will gain real experience in managing and developing existing production units in schools ultimately will foster a positive attitude toward student entrepreneurship (Barral and Canever, 2018). However, the school environment alone is not sufficient in fostering a positive attitude of student entrepreneurship, but also the family and community environment. According to Buchari (2009), the factors driving the entrepreneurial ability are not only a factor of the educational environment but also the encouragement of family and friends. Thus it is suspected that there is a direct positive influence of the learning environment on entrepreneurial attitudes, the more conducive the learning environment, the more favourable the entrepreneurship attitude of the students, the less conducive the learning environment, the more negative the entrepreneurship attitude of the students. Thus there is a positive direct effect on the learning environment on self-efficacy, meaning a more conducive learning environment then the higher the self-efficacy otherwise less conducive learning environment, the lower the selfefficacy. According to Bandura (1997), self-efficacy is a self-confidence of one's ability and capacity to succeed and successfully perform a specific task. There are four psychological processes of self-efficacy affecting human function that is cognitive, motivational, effective and selective. Self-efficacy plays an important role in controlling anxiety, where self-confident individuals can cope with threatening situations and not feel anxious about the threat. With the increase of self-efficacy, the anxiety in a person will be reduced and replaced by a positive attitude. In the context of entrepreneurship education, self-efficacy is self-confidence that students have in their ability to organize and implement actions that include magnitude, strength, and generality (Piperopoulos and Dimov, 2015; Zhao et al., 2005). Self-efficacy will determine the form of action to be performed, accompanied by how much effort they will be doing, how strongly they survive in the face of obstacles and failures, and how tough in the face of setbacks. Students with strong self-efficacy can complete tasks although difficult. They see difficulty as a challenge to face, not a threat to avoid (Peng et al., 2012; Zhao et al., 2005; Luis and Campo, 2010; Akmaliah, 2010). Moreover, students with strong self- entrepreneurial self-efficacy will be readily shaped and developed through entrepreneurship education (Fayolle, 2014; Carswell, 2006; Fang 2005). This entrepreneurial self-efficacy has been widely studied as a personality trait that motivates entrepreneurial behaviour (Chen and Crick, 1998; Akmaliah, 2010), and enables entrepreneurs to successfully perform complex and heavy tasks throughout the entrepreneurial process (Wilson et al., 2007). Self-efficacy even affects the ability of entrepreneurs to recognize business opportunities, manage resources and overcome challenges in entrepreneurship (Kumar 2007; Wilson et al., 2007; Akmaliah, 2010). Some empirical findings related to the direct impact of self-efficacy on entrepreneurship (Zhao et al., 2005; De Noble et al., 1999). However, there are still few studies focusing on selfemployment entrepreneurial effectiveness at the upper secondary and college level (Wilson et al., 2007), as well as in SMK (Akmaliah, 2010). H1: There is a direct positive influence on learning environment on entrepreneurial attitude. H2: There is a positive direct effect of self-efficacy on entrepreneurial attitude. H3: There is a direct positive influence on the learning environment on self-efficacy. H4: Thereisaninfluenceofthelearningenvironmentonentrepreneurialattitudes by mediating self-efficacy. Based on the literature review above, this study is addressed to examine a theoretical framework as illustrated below in Figure 1. This research used survey method. Data were collected using a questionnaire. To measure entrepreneurial attitude, the authors adapted indicators from Akmaliah et al. (2010), Thomas and Mueller (2000), Schwarz et al. (2006) and Robinson et al. (1991). Furthermore, learning environment adapted indicators from Soria and Rodríguez (2017) and Barral and Canever (2018). Moreover, entrepreneurial self-efficacy the author adapted indicators from Kumar (2007), Wilson et al. (2007); Akmaliah (2010). Likert scale 1-5 is used for each indicator with 1 to strongly disagree and 5 to strongly agree. Research respondents were taken in the randomly selected provinces of Jakarta, namely East Jakarta, Central Jakarta, South Jakarta, West Jakarta and North Jakarta. East Jakarta took 60 respondents, Central Jakarta was taken 60 respondents, South Jakarta took 60 respondents, West Jakarta taken 60 respondents and North Jakarta taken 60 respondents each selected randomly. Determination of the number of samples in this study using the formula Isaac and Michael, which is as many as 300 vocational students. The second stage was confirmatory factor analysis using AMOS version 22. Path coefficient is significant when C.R. value or t-value ≥ 1.98 (Holmes-Smith, 2010). To achieve a fitted model, the tested model should have some criteria and cut-off values, namely p (probability) of>0.5 (Schermelleh and Müller, 2003), CMIN/DF of<2 (Tabachnick and Fidell, 2007), CFI of >0.95 (Hu and Bentler, 1995) and RMSEA of ≤ 0.05 (Hu and Bentler, 1999). Hypothesis testing in this study uses SEM with the AMOS program to explain the direct influence of the learning environment on entrepreneurship attitude, the direct effect of selfefficacy on entrepreneurial attitudes, the direct influence of the learning environment on selfefficacy and the influence of the learning environment on entrepreneurial attitudes by mediating self-efficacy. 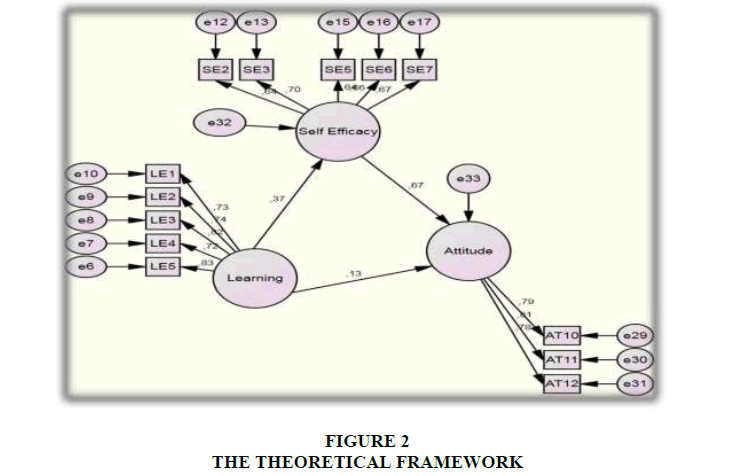 Figure 2 demonstrates a fitted model of the theoretical framework produced by confirmatory factor analysis (structural equation modelling). This study consists of three constructs, namely the learning environment, self-efficacy and entrepreneurial attitudes with Cronbach's alpha scores of 0.89; 0.84; and 0.90. Thus all constructs are reliable with a score of more than 0.70. Furthermore, all indicators are valid with a loading factor of more than 0.50. Continuing the confirmatory factor analysis, the authors tested three hypotheses developed by verifying the C.R. values. Table 1 figures a summary of hypothesis testing from the model. The result showed that the learning environment direct positively influenced self-efficacy (C.R=5.381). Meanwhile, the learning environment and self-efficacy had a significant impact on entrepreneurial attitude. C.R. value of learning environment and self-efficacy are 2.09 and 8.768 respectively. These C.R values are higher than 1.98. It means that the regression weight for the learning environment and self-efficacy in the prediction of entrepreneurial attitude is significantly influenced. Based on the Sobel Test, the value of Z=5.45 is higher 1.98, which means the learning environment influences entrepreneurial attitudes by mediating self-efficacy. Based on the calculation of SEM for examining the theoretical framework, a fitted model was obtained with a probability of 0.053; CMIN/DF score of 1.304; RMSEA score of 0.032; and CFI scores of 0.988. These grades are needed for obtaining a fitted model. The results of the study found that the learning environment has a direct positive effect on entrepreneurial attitudes, meaning that the positive and negative attitudes of students towards entrepreneurship can be explained by the learning environment. The results of this study are in line with the findings of Afzal et al. (2013), that the learning environment in the classroom can develop positive attitudes of students. The results confirm the findings of Florin et al. (2007); Mitra and Matlay (2004); Wyk and Boshoff (2004); Robinson et al. (1991) that the less conducive the learning environment, the lower the entrepreneurial attitude of students. This finding is logical, the low influence of the learning environment on entrepreneurial attitudes is because students still have a negative attitude towards entrepreneurship, both against business opportunities, business risk capital and profession as entrepreneurs. This is due to the learning environment that is less supportive in encouraging students to entrepreneurship such as learning facilities in the form of laboratories and libraries that are less supportive; the learning process has not provided the real experience to students and the low support of parents and surrounding communities towards the profession as an entrepreneur. Therefore to optimize the positive attitude of students towards entrepreneurship must be sought to create a more conducive learning environment. The results of this study also support and reinforce the findings of Harrirs and Gibson (2008), Kundu and Rani (2008); Schwarz et al. (2009); that attitude formation can be done through the creation of a conducive learning environment. Attitudes are formed through four types of learning, namely: (1) classical conditioning (classical conditioning: Learning Based on Association), the learning process can occur when a stimulus/stimulus is always followed by another stimulus/stimulus so that the first stimulus becomes a signal for incentives the second. Over time, people will learn if the first stimulus appears, then a second stimulus will be followed. (2) Instrumental conditioning (instrumental conditioning), the learning process occurs when a behaviour brings pleasant results to someone, then the behaviour will be repeated. Conversely, when behaviour brings unpleasant results, the behaviour will not be repeated or avoided. (3) Learning through observation (observational learning, learning by example), the learning process by observing the behaviour of others, then being used as an example to behave similarly. Much behaviour is done by someone because they only observe the behaviour of others. (4) Social comparison (Social Comparison), the learning process by comparing other people to check whether our views on a matter are right or wrong. A person often has a certain positive or negative attitude towards the object of attitude because it compares and wants to identify with others. This attitude is formed or obtained by someone through advice from people who are known and the results of this study indicate that self-efficacy has a direct positive effect on entrepreneurial attitudes, meaning that the positive and negative attitudes of students towards entrepreneurship can be explained by self-efficacy. The results of this study are in line with the findings of Wilson et al. (2007), Zhao et al. (2005), Chen et al. (1998) and Akmaliah (2010), that the higher the self-efficacy, the higher the entrepreneurial attitude of students. This finding also reinforces the opinion of Wilson et al. (2007) that self-efficacy has a positive impact on students' entrepreneurial attitudes. Based on the results of research that are supported by relevant research and theory shows that the high level of self-efficacy of students will determine the form of action to be taken accompanied by how much effort they will do, how strong they survive in facing obstacles and failures, and how strong in the face setbacks. Students with strong self-efficacy, they can complete tasks even though difficult and see difficulties as challenges that must be faced, not threats that must be avoided. Thus, through high efficacy will foster a positive attitude in students. The results of this study support the findings of Harris and Gibson (2008); Kundu and Rani (2008); Schwarz et al. (2009); Wibowo (2018) that the establishment of entrepreneurial self-efficacy can be done through the creation of a conducive learning environment. This study also confirms the findings of Bruff (2009) that the environment has a positive direct effect on increasing entrepreneurial self-efficacy. The family and community environment, for example, the values that families in still in a child, such as encouragement to go forward and perform without pressure excessive can shape self-efficacy of entrepreneurship in children. Likewise the community environment, where the surrounding environment that supports the birth of nature and entrepreneurial spirit will influence the formation of entrepreneurial self-efficacy. In reality, many parents prefer their children to be employees/employees of a company or government institution because being an entrepreneur has a high risk of failure and significant capital. Thus, the learning environment hypothesis has a direct positive effect on entrepreneurial self-efficacy. This study aims to determine: (1) direct positive influence of learning environment on self- efficacy of entrepreneurship; (2) positive direct influence of learning environment on entrepreneurship attitude, (3) direct positive influence of learning environment and selfentrepreneurial self-efficacy towards entrepreneurship attitude, and (4) entrepreneurial selfefficacy mediate influence of learning environment towards entrepreneurial attitude. Based on the objective findings it was concluded that the learning environment had a direct positive effect on entrepreneurial attitude. The learning environment also has a positive direct effect on the selfdetermination of influential entrepreneurship. Furthermore, the learning environment and selfentrepreneurial self-efficacy have a direct positive effect on entrepreneurial attitude. 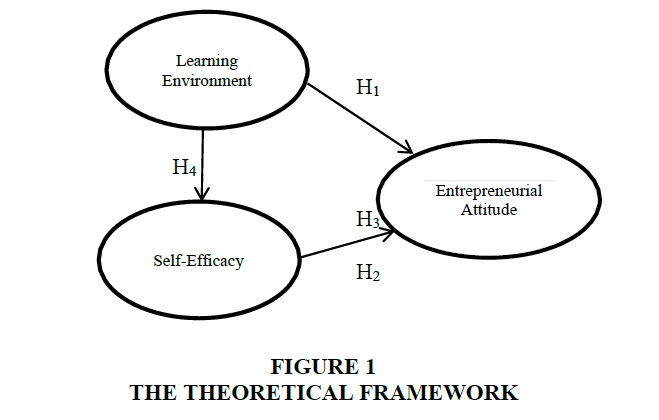 Moreover, entrepreneurial self-efficacy mediates the influence of learning environment on an entrepreneurial attitude. Based on the conclusions suggested: teachers, to improve their competence in the field of entrepreneurship through advanced studies, professional training and entrepreneurship seminars; improving the quality of learning process through problem based learning and experiential learning, for example through business incubation and social modeling by utilizing the entrepreneurship laboratory; preparation or development of entrepreneurship teaching materials. Principal, to support and provide opportunities for teachers to pursue higher education and attend training and seminars to be more competent in their fields; facilitating and developing business incubation in schools; facilitating the implementation of the workshop on entrepreneurship in schools. Head of Education Office to add facilities in schools such as business incubation as laboratories, internet networks, books, and other literature to support improving the quality of entrepreneurship learning in schools, the development of entrepreneurship curriculum that can form entrepreneurship competencies and foster entrepreneurship intentions in students. The influence of self-efficacy on entrepreneurial attitude in the results of this study is low because students still have negative attitudes towards entrepreneurship, both on business opportunities, capital risk business and profession as an entrepreneur. This is because students are afraid of failure, lack of courage to face challenging jobs, quickly give up when faced with problems that are difficult to solve, students still depend on others in task completion and low levels of knowledge about pioneering or starting a business. Therefore, to optimize the positive attitude of students to entrepreneurship should be attempted to increase students' self-efficacy. Although this research tries to provide a better view of entrepreneurship education, particularly in self-learning environments and entrepreneurial attitudes, it may be different from other schools as a result of cultural differences, the ability of teachers and the model of learning to be undertaken. Bruff,D. (2009). Teaching with Classroom Response Systems: Creating Active Learning Environments. Jossey-Bass: San Francisco, CA. Fang., & Zhao. (2005). Exploring the synergy between entrepreneurship and innovation.International Journal of Entrepreneurial Behavior & Research, 11(1), 25-41.